Skeletal muscle undergoes regeneration after damage caused by physical trauma, chemical injury and diseases such as the muscular dystrophies. This regenerative process mimics embryonic development of skeletal muscle in terms of the activation of transcriptional myogenic genes that are engaged. However, adult regenerative myogenesis is distinct from embryonic myogenesis in that the environmental cues that define the process of recovery of musculature differ from those in embryogenesis. In particular, inflammation is initiated upon muscle injury, a process that is required for the appropriate resolution of muscle repair. Prolonged or dysregulated inflammation may impair regenerative myogenesis. For example, it has been reported that defects in macrophage transition from the M1 pro-inflammatory to the M2 anti-inflammatory status result in dysfunctional muscle recovery and repair[2,3]. Among the many signaling networks that are involved in the progression of regenerative myogenesis, the mitogen-activated protein (MAP) kinases (MAPKs) have been shown to play a critical role. In particular p38 MAPK, has been established to be a potent promyogenic MAPK[4-8]. Although other MAPKs have been implicated in the regulation of regenerative myogenesis, such as the extracellular signal-regulated kinases 1 and 2 (ERK1/2) and the c-Jun NH2-terminal kinases (JNKs), whether these MAPKs play either an exclusively positive or negative role in regenerative myogenesis has remained unclear. In some cases, ERK1/2 has been reported to positively and negatively regulate regenerative myogenesis[9-11]. Similarly, JNK has been reported to exhibit both positive and negative effects on regenerative myogenesis[12-14]. Thus, the actions of the MAPKs are complex and their integral regulation in the regenerative myogenic pathway remains poorly understood. In order to investigate the interplay between MKP-1 and MKP-5 in the regulation of regenerative myogenesis, we generated mice lacking both Mkp-1 and Mkp-5. Our findings reveal that Mkp-1/Mkp-5 double knockout mice exhibit impaired skeletal muscle regeneration similar to that of MKP-1 deficient mice. These observations demonstrate that MKP-1 predominates over the actions of MKP-5 to promote regenerative myogenesis suggesting that MKP-5 serves to negatively modulate regeneration later during the process of skeletal muscle repair. Cardiotoxin (CTX) from Naja mossambica mossambica was purchased from Sigma Aldrich (St. Louis, MO, USA). For immunohistochemical staining, Pax7, bromodeoxyuridine (BrdU) and myosin heavy chain (MF20) antibodies were purchased from the Developmental Studies Hybridoma Bank (Iowa City, IA). Ly6b.2 (clone 7/4) and CD11b were purchased from AbD Serotec (Raleigh, NC). For fluorescence-activated cell sorting (FACS), propidium iodide (PI), CD31-APC, CD45-APC, Sca1-PerCP-Cy5.5, Biotinylated-Vcam1; PE/Cy7-streptavidin, Ly6G/C-PE-Cy7, F4/80-Alexa Fluor 488, and CD206-PE were purchased from BioLegend (San Diego, CA). Calcein Blue Viability Dye was purchased from eBioscience (San Diego, CA). Mkp-1 and Mkp-5 double knockout mice were generated by intercrossing the previously described Mkp1-/- and Mkp5-/- mice. These two knockout lines were bred to generate Mkp1-/-; Mkp5-/- breeders which were then used to generate Mkp1-/-; Mkp5-/- offspring. We used C57BL/6J mice as wild type controls. All the procedures and protocols were approved by the Virginia Polytechnic Institute and State University Institutional Animal Care and Use Committee. Mice were anaesthetized by intraperitoneal injection (10 mg/kg ketamine and 1 mg/kg xylazine). To induce muscle damage, we injected 80 or 300 μl of cardiotoxin (CTX, 0.1 mg/ml in PBS) into the tibialis anterior or gastrocnemius muscle, respectively. The contralateral muscle was injected with phosphate buffered saline to serve as a control. At the indicated time following muscle injury, muscles were harvested, enzymedigested for FACS analysis, or fixed overnight in 10% neutral-buffered formalin and embedded in paraffin for hematoxylin and eosin staining. Muscle sections were stained by hematoxylin and eosin, muscle cross-sectional area (CSA) was assessed using the NIH image J software. Each measure was derived from 10 randomly chosen fields per muscle section corresponding to more than 1,000 counted fibers per muscle. Ly6b.2 and CD11b staining was performed using paraffin-embedded muscle sections with a 3, 3-Diaminobenzidine (DAB) Peroxidase Substrate Kit (Vector Laboratories, Burlingame, CA). SCs were isolated using a two-step enzyme digestion. Briefly, pooled muscles from mouse hind limb were minced and digested in F-10 medium containing 500 U/ml collagenase II and 10% horse serum for 90 min at 37°C with constant agitation. The digest was then triturated (20-times) to physically disperse muscle into single fiber fragments. After a brief wash in F-10 containing 10% horse serum, the fiber fragments were further digested in F-10 medium containing 38 U/ml collagenase II, 0.5 U/ml dispase II and 10% horse serum for 30 min with constant agitation. The digest was diluted and passed through a 12 ml syringe with a 20-gauge needle 10 times to release SCs. The digest was subjected to centrifugation at 500 g for 1 min. The supernatant was centrifuged at 1000 g for 5 min to pellet SCs. For clonal assays, the cells were dispersed in growth medium (F-10 medium containing 20% FBS, 1% penicillin and streptomycin, and 5 ng/ml bFGF) and seeded on collagen-coated dishes. For enrichment of SCs for proliferation and differentiation, cells were grown on Matrigel-coated dishes. To evaluate SC proliferation, we pulsed SCs with 10 μM BrdU for 1h, and stained them with anti-BrdU antibody. Brdu was detected by fixing cells in 70% ethanol for 30 min, and BrdU antigen was exposed by incubating in 1.5 M HCl for 30 min at room temperature. To differentiate cultured SCs, growth medium was removed, cells were washed with PBS twice, and incubated in differentiation medium (DMEM containing 2% horse serum and 1% penicillin and streptomycin) for 3 days. For immunohistochemistry, paraffin-embedded muscle sections were deparaffinized in xylene followed by rehydration. The slides were incubated at 95°C in sodium citrate buffer (10 mM Sodium Citrate, 0.05% Tween 20, pH 6.0) for 30 min followed by 20 min incubation at room temperature. Pax7-positive SCs were detected using a M.O.M kit from Vector Laboratories (Burlingame, CA) according to the manufacturer’s instruction. To stain nuclei, DAPI was simultaneously applied with the secondary antibodies at a concentration of 0.1%. Images were acquired using a Zeiss LSM 510 meta confocal microscope. Ten random fields per muscle section corresponding to approximately 1,000 fibers per muscle were imaged and counted. For immunocytochemistry, 3 day differentiated SCs were fixed in 4% paraformaldehyde at room temperature for 10 min followed by permeabilization in 0.2% triton X-100 for 3 min. Cells were blocked in 5% goat serum for 30 min at room temperature before applying anti-myosin primary antibody (MF20). Total RNA from wild-type and MKP1/5-DKO muscles were extracted using Directzol RNA Miniprep Kit (Zymo Research, Irvine, CA). Reverse transcription was carried out using a High-Capacity cDNA Reverse Transcription Kit (Life Technologies, Grand Island, NY). Samples were run in triplicate in a 96-well microplate using Fast SYBR Green Master Mix (Life Technologies, Grand Island, NY) and 7500 Fast Real Time PCR System (Life Technologies, Grand Island, NY). Primer sequences used for M1 and M2 macrophage marker genes were as described previously. Transcripts were quantified using ΔΔCT method. Hprt serves as an internal control. TaqMan primers for Mkp1, Mkp5 and 18S rRNA were purchased from ThermoFisher Scientific (Grand Island, NY). Gene expression of Mkp1 and Mkp5 was normalized to 18S rRNA using ΔΔCT method. In order to examine macrophage skewing repolarization, damaged skeletal muscle was isolated at the indicated times after cardiotoxin injection, minced into a slurry with scissors, and digested in DMEM containing 0.2% collagenase B at 37°C for 1h with constant agitation. The digest was diluted with wash buffer (DMEM containing 10% horse serum) and pelleted at 500 g for 1 min. The supernatant was centrifuged at 400 g for 5 min to pellet SCs. For FACS analysis, cells were stained with a panel of antibodies on ice for 15 min, washed in 10 ml of wash buffer before FACS analysis using a BD FACS Aria II flow cytometer. For SC FACS, isolated cells were stained with biotinconjugated Vcam1, CD31-APC, CD45-APC, Sca1-APC. PE/Cy7-streptavidin was used to detect Vcam1-biotin. Propidium iodide (PI) and Calcein Blue AM were used to gate dead and live cells respectively during sorting. SCs were identified by the surface marker complementation representing Vcam1+ CD45- CD31- Sca1- . The data analysis was using GraphPad Prism version 6.0. Data are presented as mean ± S.E.M. Differences in the fiber size were analyzed with Chi square tests. To test for differences in the number of nuclei per fiber an one-way ANOVA was used. The significance level was set as * P < 0.05; ** P < 0.01; *** P < 0.001. We have shown that MKP-1-deficient mice are inhibited in their ability to undergo regenerative myogenesis. In contrast, MKP-5-deficient mice exhibit an enhanced regenerative capacity. In order to determine the hierarchy between MKP-1 and MKP-5 for the process of skeletal muscle regeneration we intercrossed Mkp-1-/- and Mkp-5-/- mice to generate progeny that were deficient in both MKP-1 and MKP-5. MKP-1 and MKP-5 deficient double knockout mice were confirmed through both genotype-specific PCR (data not shown) and quantitative PCR (Figure 1A) for the expression of Mkp-1 and Mkp-5 and are referred to herein as MKP1/5-DKO mice. Male MKP1/5-DKO mice showed comparable body weights and muscle weights as compared with wild type mice (Figure 1B-C). Histologically, skeletal muscle from undamaged MKP1/5-DKO mice was unremarkable and myofibers were equivalent in size as compared with wild type controls (Figure 1D-F). However, when subjected to injury by cardiotoxin injection, we found that MKP1/5-DKO mice were severely impaired in their ability to regenerate skeletal muscle (Figure 1G). MKP1/5-DKO mice following injury had much higher numbers of small-sized myofibers as compared with wild type injured mice (Figure 1G). In addition, both myofiber cross-sectional area and the number of myofibers with greater than 2 or more nuclei were significantly reduced in regenerating MKP1/5-DKO mice as compared with skeletal muscle from wild type mice (Figure 1I-J). 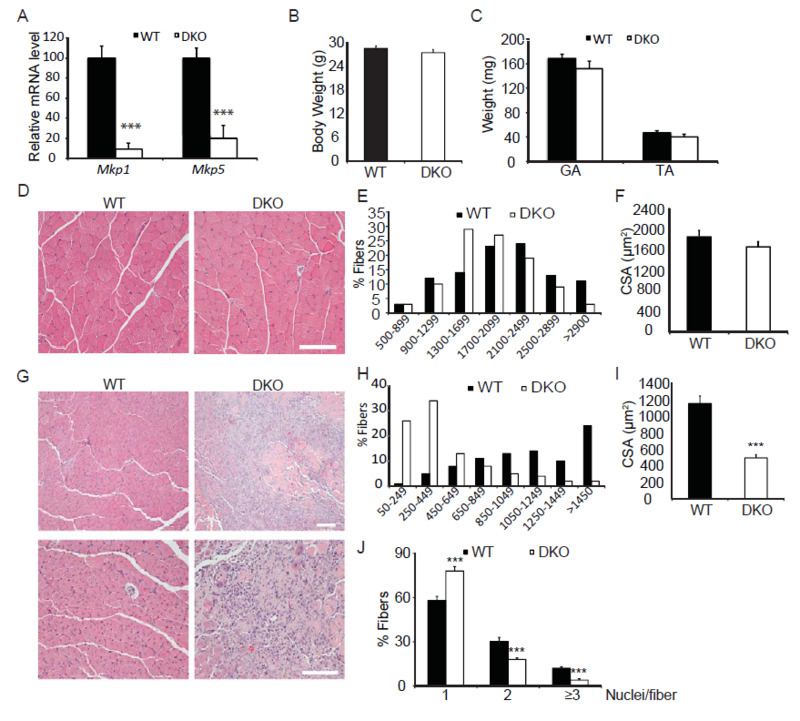 These results demonstrate that an MKP1/5-DKO mouse are impaired in their ability to undergo regenerative myogenesis and suggests that loss of both MKP-1 and MKP-5 recapitulates a regenerative defect similar to that achieved by MKP-1 deficiency. Since satellite cells (SCs) play a pivotal role in muscle regeneration[23-25], we assessed the status of SC number on muscle fibers of MKP1/5-DKO mice. As shown in Figure 2A, SCs were identified by FACS using a combination of surface marker expression that represented the following composition: Vcam1+ CD45- CD31-Sca1- . We found that SCs in MKP1/5-DKO muscle were significantly lower in number as compared with SCs derived from wild-type muscle (Figure 2B). In agreement with the FACS analysis, Pax7+ cells per 100 muscle fibers was also significantly decreased in MKP1/5-DKO mice (Figure 2C). Together, these data demonstrate that MKP-1 and MKP-5 deficiency results in a reduced SC population consistent with the impaired ability of these mice to undergo skeletal muscle regeneration. Figure 1: Skeletal muscle regeneration is impaired in Mkp1/5-DKO mice. 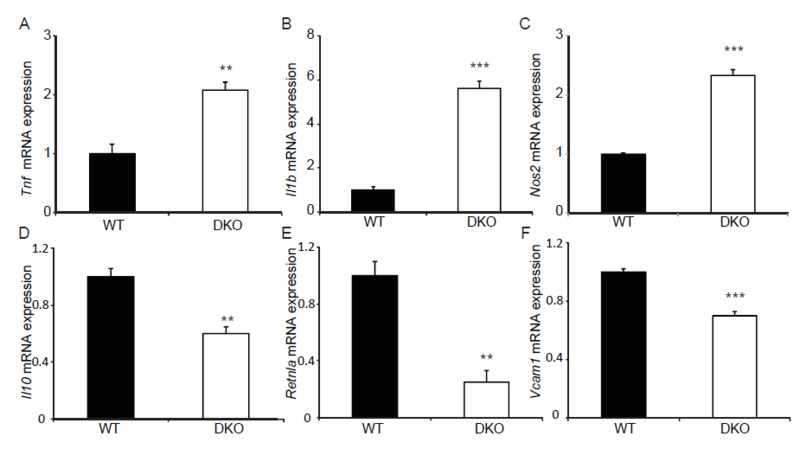 (A) Mkp1 and Mkp5 mRNA expression in WT and DKO muscles. (B-C) Mouse body weight (B) and weights of gastrocnemius (GA) and tibialis anteria (TA) muscle (C). (D) H&E staining of non-damaged GA muscle. (E-F) Histogram (E) and quantification (F) of the cross sectional area (CSA) of non-damaged GA muscle. (G) H&E staining of WT and DKO GA muscles 11 days post cardiotoxin-induced injury. (H-I) Histogram (H) and quantification (I) of the CSA of the newborn fibers in (G). (J) Quantification of the fibers containing 1, 2, or 3 and more nuclei in (G). Scar bars in (D and G), 100 μm. Data represent means ± SEM from n = 6 eight-week-old males in each genotype. *** P < 0.001 compared to WT. Figure 2: MKP1/5-DKO mice have reduced muscle stem cell content. (A) Pooled hindlimb muscles were digested to isolate single cells for flow cytometry. SCs were sorted based on the surface markers Vcam+CD45- CD31-Sca1-. Calcein Blue AM was used to identify live cells, whereas propidium iodide for dead cells. (B) SC content in WT and DKO muscles. Values on the gates represent percent of muscle stem cells of the live cells (Calcein Blue AM+PI- population). (C) Muscle cryosections were stained for Pax7, and the number of Pax7+ cells was counted. Data represent means ± SEM from n = 6 mice in each genotype. *** P < 0.001 compared to the WT mice. Given that MKP1/5-DKO mice have impaired muscle regeneration (Figure1) and reduced SC number (Figure 2) we next assessed whether SCs from MKP1/5-DKO mice were altered in their ability to proliferate. SCs derived from MKP1/5-DKO mice were found to have reduced proliferative capacity evaluated either by clonal assay (Figure 3A and B) or by BrdU incorporation assay (Figure 3C and D). Despite the observation that MKP1/5-DKO SCs were inhibited in their ability to proliferate, when assessed for their differentiating capacity, MKP1/5-DKO SCs formed multinucleated myotubes as efficiently as wild type SCs (Figure 3E and F). Thus, MKP1/5-DKO SCs appear to reflect the impaired proliferative phenotype of MKP-1-deficient SCs rather than that of MKP-5-deficient SCs. However, neither the MKP-1-deficient nor the MKP-5-deficient differentiation phenotypes are recapitulated by loss of both MKP-1 and MKP-5. Therefore, the negative effects of MKP1/5-DKO on regenerative myogenesis are largely attributed to the proliferative defect, rather than the failure of SCs to differentiate. 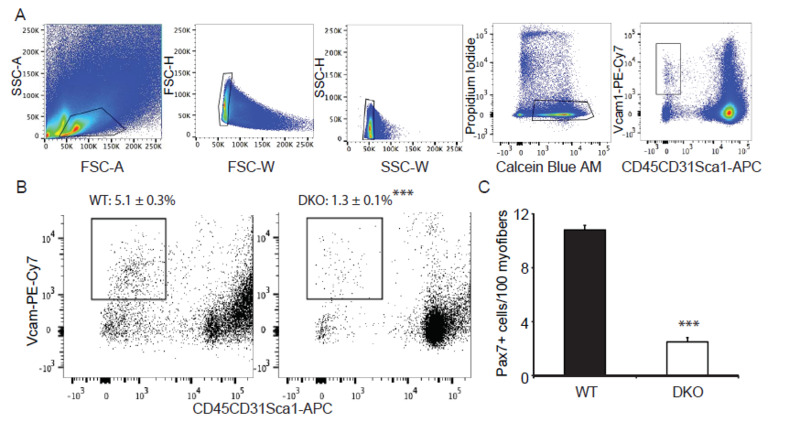 Figure 3: MKP1/5-DKO SCs have impaired prolifertation in vitro. (A-B) Histogram (A) and quantification (B) clone size of the isolated SCs. SCs were isolated from skeletal muscles from WT and DKO mice, and cultured in collagen-coated plate for 7d. (C-D) Representative photo micrographs (C) and quantification (D) of BrdU incorporation into SCs. SCs were isolated and cultured as in (A-B). BrdU (10 μM) was added to the culturte medium for 1h before fixation and staining. (E-F) Representative photo micrographs (E) and quantification (F) of SC differentiation in vitro. SCs were isolated and cultured in Matrigel-coated plates. Equal number of cells were plated and induced to differentiate for 3d. Scar bars in (C and E), 200 μm. Data represent means ± SEM from three independent experiments. ***P < 0.001 compared to WT. Alongside the primary contribution of SCs to the recovery of musculature post injury, infiltrating immune cells, macrophages in particular, play an indispensable role[26,2]. Previously, we showed that in mice lacking MKP-1 the immune response was dramatically enhanced following injury. In contrast, MKP-5-deficient mice following muscle injury showed a comparable degree of inflammatory responsiveness as compared to wild type mice. Therefore, we examined the inflammatory response in post muscle injury in MKP1/5-DKO mice. We stained skeletal muscle sections from 2 day post-injured wild type and MKP1/5-DKO mice with Ly6b.2, a marker for the identification of neutrophils, inflammatory monocytes, and activated macrophages. This analysis revealed that skeletal muscle derived from MKP1/5-DKO mice contained increased levels of infiltrating Ly6b.2 positive cells (Figure 4A). Next, we examined the 11 day injured skeletal muscle, and this showed that there were widespread Ly6b.2+ cell clusters in MKP1/5-DKO muscle sections compared with the scattered distribution of these cell types in wild type muscle (Figure 4B and D). CD11b, a marker of granulocytes, monocytes, NK cells, and tissue macrophages, increased markedly in MKP1/5-DKO muscle 11 days post injury (Figure 4B and C). 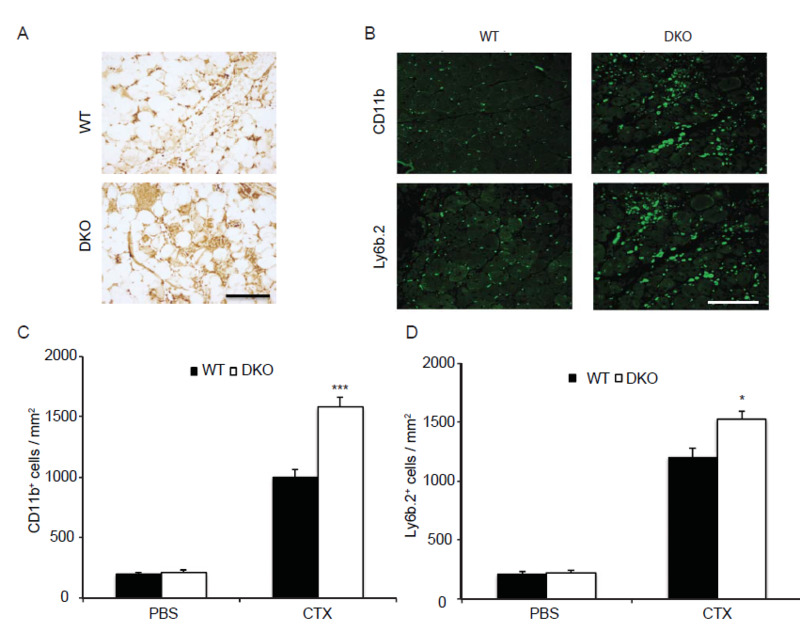 Collectively, these findings indicate that MKP1/5-DKO mice mount a profoundly hyperactive inflammatory response during the regeneration process, a phenotype similar to that of loss of MKP-1 alone. Figure 4: MKP1/5-DKO muscle exhibits enhanced inflammatory responses after damage. GA muscle from eight-week-old mice was damaged by cardiotoxin injection. (A) 42h post injury, muscles were harvested; muscle sections were stained with Ly6b.2 antibody. (B-D) 11d post injury, muscles were stained for CD11b and Ly6b.2 respectively (B) and quantified (C and D). Data represent means ± SEM from n = 6 males in each genotype. * P < 0.05; *** P < 0.001 compared to WT. Scale bars, 100 μm. MKP-1 is a negative regulator of the immune response[28-30] and MKP-1 deficiency leads to delayed myogenic regeneration which, is in part, related to an unchecked inflammatory response as well as a deregulated transition of M1 to M2 macrophages[20,21]. In contrast, MKP-5-deficiency results in an equivalent level of inflammatory responsiveness following skeletal muscle injury. Therefore, we assessed the effect of MKP1/5-DKO on the polarization of macrophages between the M1 and M2 transition states. We first selected M1 and M2 macrophage-specific markers and assessed whether their gene expression profiles were altered between wild type and MKP1/5-DKO mice. We found that all three M1 macrophage genes Tnf, Il1b, and Nos2 were significantly up-regulated in MKP1/5-DKO mice (Figure 5A-C). In contrast, M2 macrophage makers Il-10, Retnla and Vcam1 were significantly down-regulated 3 days-post injury (Figure 5D-F). 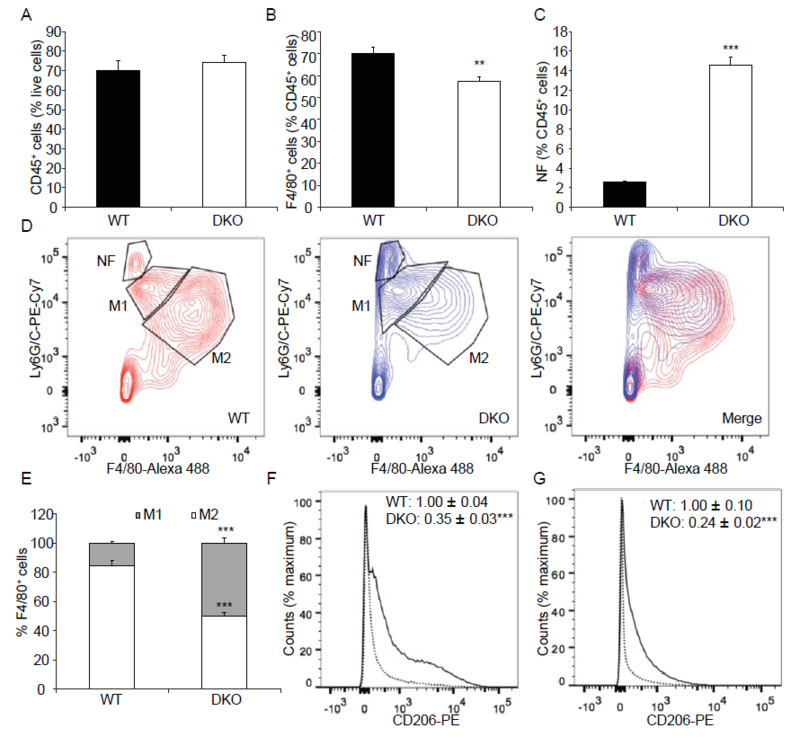 Figure 5: MKP1/5-DKO differentially affects M1 and M2 macrophage marker gene expression. 3 days post injury, TA muscle was harvested, RNA was extracted and quantitative RT-PCR was performed to detect gene expression of M1 and M2 macrophage markers. (A-C) Relative mRNA abundance of M1 macrophage markers Tnf (A), Il1b (B), and Nos2 (C). (D-F) Relative mRNA abundance of M2 macrophage markers Il10 (D), Retnla (E), and Vcam1 (F). Data represent means ± SEM from n = 5 in each genotype. **P < 0.01; ***P < 0.001 compared to WT. 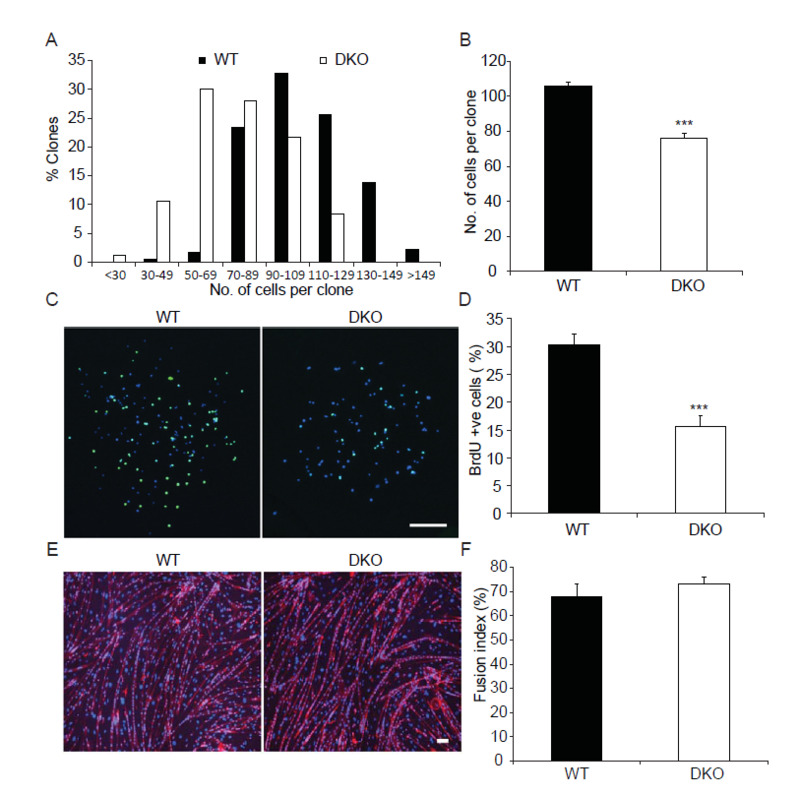 Figure 6: MKP1/5-DKO impairs macrophage skewing during muscle regeneration. Tibialis anterior muscle was injected with cardiotoxin, 3d (A-F) or 6d (G) later, muscles were harvested, digested, and underwent FACS analysis. (A) % CD45+ cells in damaged muscle. (B) % F4/80+ cells of CD45+ cells. (C) % Neutrophil (NF) (F4/80-Ly6G/Chi) of CD45+ cells. (D) Neutrophil (NF) (F4/80- Ly6G/Chi), M1 macrophage (F4/80loLy6G/Chi) and M2 macrophage (F4/80hiLy6G/Clo) populations of CD45+ cells. (E) M1 and M2 subpopulations of F4/80+ cells. (F) CD206 expression in F4/80+ cells from 3d post injury muscles. Solid line, WT; Dotted line, DKO. (G) CD206 expression in F4/80+ cells from 6d post injury muscles. Solid line, WT; Dotted line, DKO. (F- G) Insets: values represent relative median fluorescence intensity (MFI) of PE. Data represent means ± SEM from n = 6 four-month-old males in each genotype. ** P < 0.01; ***P < 0.001 compared to WT. A wealth of evidence supports a critical role for the MAPK/MKP pathway in the regulation of regenerative myogenesis and SC progression after muscle damage[31,16,8]. Although an intricate balance exists amongst the MKPs between their cognate MAPKs during regenerative myogenesis, a complete understanding of how these networks interact still remains unclear. This is particularly well exemplified when one considers the actions of MKP-1 and MKP-5 in regenerative myogenesis. Both MKP-1 and MKP-5 dephosphorylate and thus inactivate p38 MAPK and JNK. Yet, MKP-1-deficient mice have an impaired capacity to regenerate skeletal muscle. In contrast, MKP-5-deficient mice have an enhanced skeletal muscle regenerative capacity. How these two MKPs coordinate MAPK-dependent signaling during regenerative myogenesis is unclear and the hierarchy of their effects on this process is unknown. Therefore, the goal of this study was to determine which of these MKPs plays the predominate role in MAPK-dependent signaling in skeletal muscle regeneration and SC function in order to provide a contextual perspective for the interplay between MKP-1 and MKP-5 in regenerative myogenesis. We discovered that MKP1/5-DKO mice were impaired in their ability to successfully undergo skeletal muscle regeneration. Consistent with this, SCs derived from MKP1/5-DKO mice showed defective proliferative capacity. Since, impaired regeneration and SC proliferation are observed in MKP-1-deficient mice but not in MKP-5-deficient mice these results demonstrate that the positive actions of MKP-1 predominate over the negative effects of MKP-5 on SC function and skeletal muscle regeneration. These results suggest that MKP-1/MAPK-dependent signaling is likely exerted early on during regenerative myogenesis in order to promote the repair process whereas, MKP-5 acts later on to attenuate it. How does MKP-1 exert a distinct myogenic regulatory signal from that of MKP-5 given that these MKPs dephosphorylate both p38 MAPK and JNK One plausible explanation is that the pools of MAPK dependent substrates regulated by MKP-1 and MKP-5 are non-overlapping. This is likely to be the case since MKP-1 is localized exclusively to the nucleus whereas, MKP-5 shuttles between the nucleus and cytosol. During regenerative myogenesis, the relative expression levels of MKP-1 and MKP-5 are also different. MKP-1 expression levels increase shortly after the onset of injury to skeletal muscle and return to basal levels shortly thereafter. Whereas, MKP-5 expression levels are down regulated within the first 48h during myogenesis and return to basal levels later on. As such, MKP-1 upregulation transiently inactivates MAPK signaling whereas MKP-5 downregulation promotes MAPK signaling albeit in different sub-cellular compartments. These differences likely account for why MKP-1 and MKP-5 exert unique signaling effects on SC function and regenerative myogenesis. However, these possibilities will require formal testing. Adult muscle regeneration is tightly regulated by cascades of signaling pathways that govern the fate of SCs. The success of the regenerative process is tightly integrated with that of the immune system. SC activation, expansion, and differentiation processes are intertwined with, and influenced by, the state of macrophage transition. It has been shown that MKP-1 -deficient macrophages exhibit hyper-activation of p38 MAPK, which prevents the transition of macrophages from the pro-inflammatory M1 to anti-inflammatory M2 states of activation through a p38 MAPK-miR-21-AKT pathway. This transition defect in macrophages causes the lack of resolution of inflammation which plays a key role in MKP-1 deficiency-induced impairment of muscle structure after injury. Interestingly, we found that the effect of MKP1/5-DKO in the M1 to M2 macrophage transition was similar to that of MKP-1 single ablation. These results suggest that the MKP-1/MAPK actions also predominate over the effects of MKP-5 in the immune system during skeletal muscle regeneration. Indeed, the immune response following skeletal muscle injury is comparable between wild type and MKP-5 deficient mice. The deleterious effects of the enhanced inflammatory response incurred through the loss of MKP-1 in this case are likely a major contributor to the poor outcome of regeneration in the MKP1/5-DKO mice. Recent work clearly demonstrates that defects in macrophage transition from M1 to M2 states of activation plays a critical role in muscle recovery. Shortly after muscle injury, M1 macrophages secrete cytokines that promote SC proliferation, gradually transit to a M2 phenotype and stimulate SC differentiation[2,26]. Mice carrying the Cebpb promoter with two CREB-binding mutant sites demonstrate severe impairment of muscle repair after injury, which is related to the lack of induction of M2 macrophage-specific gene expression. In an MKP-1-deficient mouse model, enhanced p38 MAPK activation blocks macrophage M1 to M2 transition and impairs muscle recovery after injury. The interplay between the MKPs as positive and negative regulators of skeletal muscle function and regeneration is unknown. Our results show that the positive actions of MKP-1 supersede that of the negative effects of MKP-5 on regenerative myogenesis and SC function. Moreover, these data demonstrate genetically that although both MKP-1 and MKP-5 dephosphorylate p38 MAPK and JNK they function to regulate skeletal muscle homeostasis through non-overlapping signaling pathways. This work was supported by NIH grants AR066003 and DK57751 to A.M.B and the MDA 186936 to H.S. 1. Charge, S.B., Rudnicki, M.A. Cellular and molecular regulation of muscle regeneration. (2004) Physiol Rev 84(1): 209-238. 2. Arnold, L., Henry, A., Poron, F., et al. Inflammatory monocytes recruited after skeletal muscle injury switch into antiinflammatory macrophages to support myogenesis. (2007) J Exp Med 204(5): 1057-1069. 3. Mounier, R., Theret, M., Arnold, L., et al. A MPK alpha1 regulates macrophage skewing at the time of resolution of inflammation during skeletal muscle regeneration. (2013) Cell Metab 18(2): 251-264. 4. Lluis, F., Ballestar, E., Suelves, M., et al. E47 phosphorylation by p38 MAPK promotes MyoD/E47 association and muscle- specific gene transcription. (2005) Embo J 24(5): 974-984. 5. Lluis, F., Perdiguero, E., Nebreda, A.R., et al. Regulation of skeletal muscle gene expression by p38 MAP kinases. (2006) Trends in Cell Biology 16(1): 36­44. 6. Perdiguero, E., Ruiz, Bonilla, V., Gresh, L., et al. Genetic analysis of p38 MAP kinases in myogenesis: fundamental role of p38alpha in abrogating myoblast proliferation. (2007) Embo J 26(5): 1245­1256. 7. Jones, N.C., Tyner, K.J., Nibarger, L., et al. The p38 alpha/beta MAPK functions as a molecular switch to activate the quiescent satellite cell. (2005) J Cell Biol 169(1): 105­116. 8. Shi, H., Boadu, E., Mercan, F., et al. MAP kinase phosphatase-1 deficiency impairs skeletal muscle regeneration and exacerbates muscular dystrophy. (2010) FASEB J 24(8): 2985­2997. 9. Weyman, C.M., Wolfman, A. Mitogen-­activated protein kinase kinase (MEK) activity is required for inhibition of skeletal muscle differentiation by insulin-­like growth factor 1 or fibroblast growth factor 2. (1998) Endocrinology 139(4): 1794­1 800. 10. Johnson, S.E., Dorman, C.M., Bolanowski, S.A. Inhibition of myogenin expression by activated Raf is not responsible for the block to avian myogenesis. (2002) J Biol Chem 277(32): 28742­28748. 11. Gredinger, E., Gerber, A.N., Tamir, Y., et al. Mitogen-­activated protein kinase pathway is involved in the differentiation of muscle cells. (1998) J Biol Chem 273(17): 10436-10444. 12. Gallo, R., Serafini, M., Castellani, L., et al. Distinct effects of rac1 on differentiation of primary avian myoblasts. (1999) Mol Biol Cell 10(10): 3137-3150. 13. Khurana, A., Dey, C.S. Involvement of c-Jun N-terminal kinase activities in skeletal muscle differentiation. (2004) J Muscle Res Cell Motil 25(8): 645-655. 14. Meriane, M., Charrasse, S., Comunale, F., et al. Transforming growth factor beta activates Rac1 and Cdc42Hs GTPases and the JNK pathway in skeletal muscle cells. (2002) Biol Cell 94(7-8): 535-543. 15. Lawan, A., Shi, H., Gatzke, F., et al. Diversity and specificity of the mitogen-­activated protein kinase phosphatase-­1 functions. (2013) Cell Mol Life Sci 70(2): 223-237. 16. Shi, H., Verma, M., Zhang, L., et al. Improved regenerative myogenesis and muscular dystrophy in mice lacking Mkp5. (2013) J Clin Invest 123(5): 2064-2077. 17. Boutros, T., Chevet, E., Metrakos, P. Mitogen-­activated protein (MAP) kinase/MAP kinase phosphatase regulation: roles in cell growth, death, and cancer. (2008) Pharmacol Rev 60(3): 261-310. 18. Wu, J.J., Zhang, L., Bennett, A.M. The noncatalytic amino terminus of mitogen-­ activated protein kinase phosphatase 1 directs nuclear targeting and serum response element transcriptional regulation. (2005) Mol Cell Biol 25(11): 4792-4803. 19. Tanoue, T., Moriguchi, T., Nishida, E. Molecular cloning and characterization of a novel dual specificity phosphatase, MKP-­5. (1999) J Biol Chem 274(28): 19949-19956. 20. Perdiguero, E., Sousa,Victor, P., Ruiz, Bonilla, V., et al. p38/MKP-1-regulated AKT coordinates macrophage transitions and resolution of inflammation during tissue repair. (2011) J Cell Biol 195(2): 307-322. 21. Perdiguero, E., Kharraz, Y., Serrano, A.L., et al. MKP-1 coordinates ordered macrophage-phenotype transitions essential for stem cell-dependent tissue repair. (2012) Cell Cycle 11(5): 877-886. 22. Cheung, T.H., Quach, N.L., Charville, G.W., et al. Maintenance of muscle stem-­cell quiescence by microRNA-489. (2012) Nature 482(7386): 524-528. 23. Buckingham, M., Montarras, D. Skeletal muscle stem cells. (2008) Current Opinion in Genetics & Development 18(4): 330-336. 24. Shi, X., Garry, D.J. Muscle stem cells in development, regeneration, and disease. (2006) Genes Dev 20(13): 1692-1708. 25. Wagers, A.J., Conboy, I.M. Cellular and molecular signatures of muscle regeneration: current concepts and controversies in adult myogenesis. (2005) Cell 122(5): 659-667. 26. Saclier, M., Yacoub, Youssef, H., Mackey, A.L., et al. Differentially activated macrophages orchestrate myogenic precursor cell fate during human skeletal muscle regeneration. (2013) Stem Cells 31(2):384-396. 27. Rosas, M., Thomas, B., Stacey, M., et al. The myeloid 7/4- antigen defines recently generated inflammatory macrophages and is synonymous with Ly-6B. (2010) J Leukoc Biol 88(1): 169-180. 28. Chi, H., Barry, S.P., Roth, R.J., et al. Dynamic regulation of pro and anti-inflammatory cytokines by MAPK phosphatase 1 (MKP­1) in innate immune responses. (2006) Proc Natl Acad Sci USA 103(7): 2274-2279. 29. Hammer, M., Mages, J., Dietrich, H., et al. Dual specificity phosphatase 1 (DUSP1) regulates a subset of LPS-­induced genes and protects mice from lethal endotoxin shock. (2006) J Exp Med 203(1): 15­20. 30. Salojin, K.V., Owusu, I.B., Millerchip, K.A., et al. Essential Role of MAPK Phosphatase-­1 in the Negative Control of Innate Immune Responses. (2006) J Immunol 176(3): 1899-1907. 31. Shi, H., Bennett, A.M. Mitogen-­Activated Protein Kinases and Mitogen-­Activated Protein Kinase Phosphatases in Regenerative Myogenesis and Muscular Dystrophy. In: Hedge M, Ankala A, editors. Muscular Dystrophy. (2012) InTech 159-172. 32. Wang, Y.X., Rudnicki. M.A. Satellite cells, the engines of muscle repair. (2011) Nature Rev Mol Cell Biol 13(2): 127-133. 33. Ruffell, D., Mourkioti, F., Gambardella, A., et al. A CREB-­C/EBPbeta cascade induces M2 macrophage-specific gene expression and promotes muscle injury repair. (2009) Proceedings of the National Academy of Sciences, USA 106(41): 17475-17480.